Republican Rep. Andy Harris (MD 1) voted to allow tax cuts of $1.5 trillion dollars without requiring any offsetting spending, increasing the deficit and debt dramatically. The proposal is particularly anti-Maryland as it would “doom the current deduction for state and local taxes,” which benefits Marylanders disproportionately, as it does residents in New York and New Jersey. Other tax deductions up for elimination that might spread the pain more evenly, such as the home mortgage interest deduction, or closing corporate loopholes, have been ruled out by tweet or as sacred cows. Nevertheless, unlike the bulk of Republicans from those states, Harris still voted yes. His budget never solves the deficit problem, much less begins to pay down the exploding national debt we will leave to our grandchildren. . . . Once again, the House will have to take leadership on reining in the debt and deficit by proposing a budget that makes the tough choices that are necessary to head off a Greek-style federal bankruptcy. Harris logic says that ballooning the debt by much less than the Republican budget is madness that will cause rack and ruin associated through “a Greek-style federal bankruptcy” when it’s proposed by Obama but not when Trump-Ryan want it. Even leaving aside the unfunded giveaway to the wealthy that is done in a way that limits benefits to Marylanders, especially more middle-income residents who still deduct, the complete shift on the debt and importance of balancing the books shows the situational ethics and moral bankruptcy of Andy Harris–and the many other Republicans who said more or less the same thing. 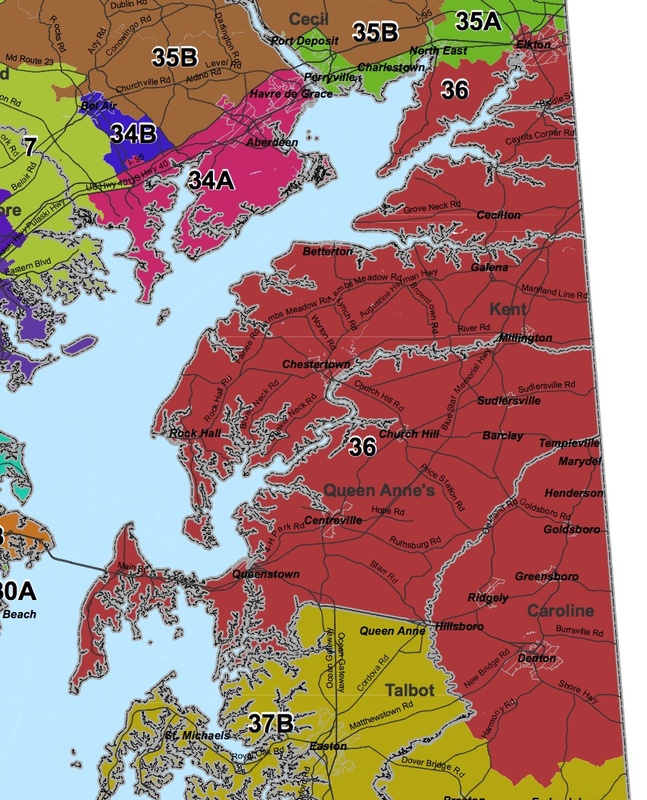 Today, I begin a series looking at the likely impact of redistricting the General Assembly based on the latest population estimates for 2020. Note that the estimates are based on the population–not the population after the prison population has been redistributed to their homes as required by Maryland law. This region of the State was slightly underrepresented–at least before the prison population was redistributed–with two districts after 2010 but will merit exactly this number in 2020. District 1A, centered on Garrett, may need to take in a bit more of Allegany with Garrett comprising just over two-thirds of the district. District 1B can remain wholly within Allegany but District 1C may need to move further into Washington County to make up the numbers depending upon how the lines are drawn. The remainder of Washington will remain District 2. 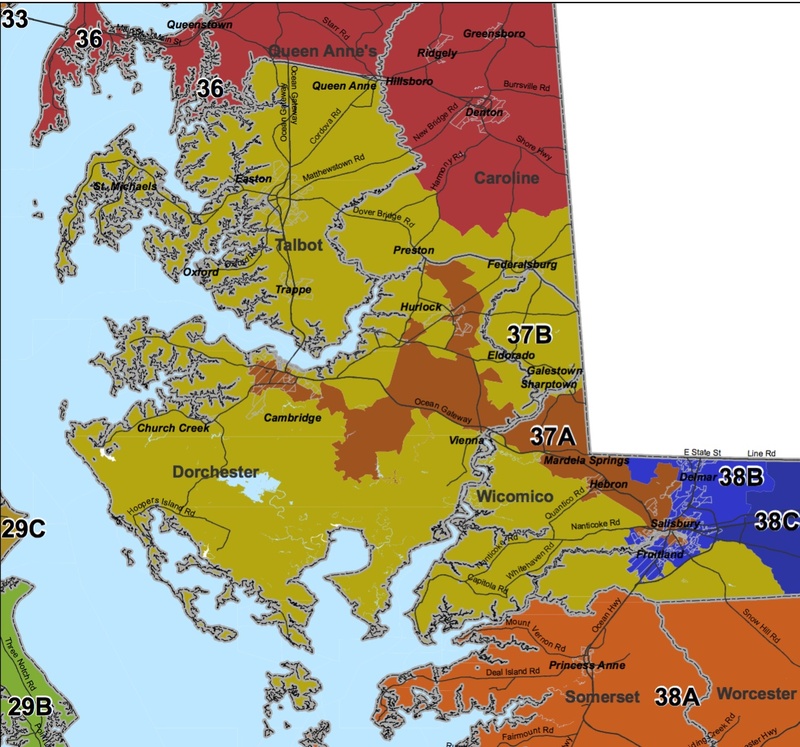 Except for Wicomico, all Eastern Shore counties will merit very slightly less representation in Annapolis in 2020. The changes, however, are so small that few alterations should be expected unless mapmakers want to realign boundaries for other reasons, such as efforts to shore up or to weaken Sen. Jim Mathias (D 38). District 38’s subdistricts could also be rearranged. Prior to 2010, there were two instead of three subdistricts with the smaller of the two centered on Somerset. Democrats will surely want to keep District 38A and to keep it attached to African-American sections of Worcester in the hopes that—if Democrats ever bother to invest in upping Somerset’s abysmal Democratic turnout—they could win a second delegate seat on the Shore. 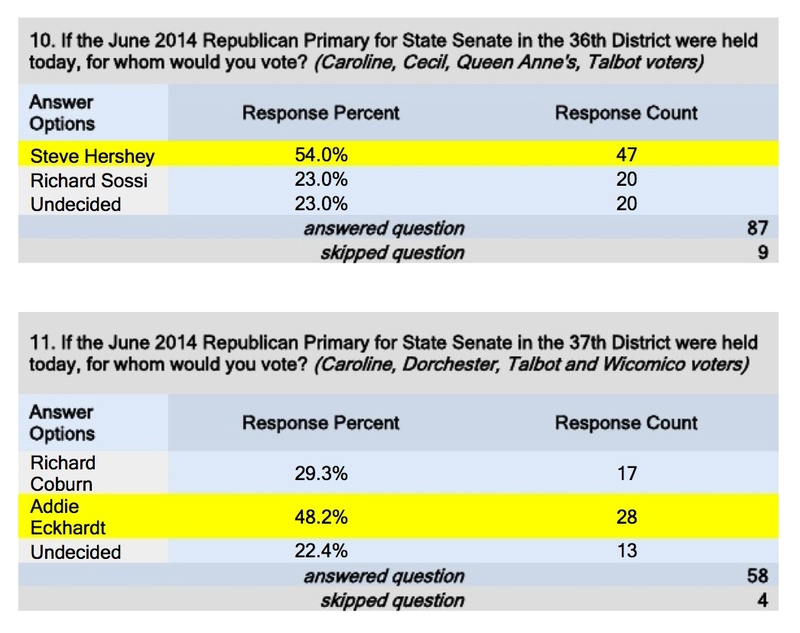 For now, it remains heavily Republican with incumbent Del. Otto winning easily with 60% in 2014. District 37A will need to remain in place to protect African-American representation and satisfy the requirements of the Voting Rights Act. Democrats will want to keep it as it is the only district on the Shore certain to elect a Democrat. I have ranked Maryland’s counties and Baltimore City from least to most Democratic based on the average of the margin of victory for the respective Republican and Democratic candidates for President in the 2008 and 2012 election cycles. Several things jump out at me about this data. The first is that only six out of 24 jurisdictions lean Democratic. Luckily, those six happen to cast the vast majority of votes in the state. Furthermore, D+16 Baltimore County can no longer considered a swing jurisdiction, as it was for many years. The same is true of Howard and Charles. These three counties are now safely Democratic. The second thing that jumps out at me is how few counties are relatively evenly split. Only Somerset, Kent, Frederick and Anne Arundel can be considered truly competitive. One could plausibly add Wicomico to that list, as well as perhaps Dorchester and Calvert if one were feeling charitable. The map also showcases what a remarkable candidate Frank Kratovil was. He won 65% of the vote in Kent County in 2008 (Obama got 49%). That year, he won the most Republican county on the shore (Queen Anne’s) by ten points. He was the State’s Attorney there, so this isn’t entirely surprising. But he also won Caroline County with 52% of the vote. Kratovil eked out a two point win in Cecil, while cruising to a nine point victory in Worcester (and a fifteen point land slide in neighboring Wicomico). In heavily Somerset County, home to a large African-American population, he won by 19 points. Frank did lose Anne Arundel, Harford and Baltimore Counties. But he managed to carry every county on the Eastern Shore. In contrast, in 2010 Governor O’Malley carried not a single Eastern Shore County. The numbers in Howard County show what a tough road to victory universally respected State Senator Alan Kittleman has. Conversely, the numbers in Anne Arundel give me hope for Democratic former Sheriff George Johnson’s bid for County Executive. The same is true of Jan Gardner in Frederick County. Republicans had once hoped to build majorities on their strength in these growing counties but it is just not happening. The Maryland Democratic Party should invest substantive resources into the registration and turnout in Somerset County. The African American percentage is similar to Charles, and there’s no reason that Somerset couldn’t be delivering victories of victory for Team Blue. While in a county of a little over 26,000 this isn’t a game changer, it certainly is one of the view places with severe Democratic under performance in Maryland. It could also make a real difference in the Somerset’s government. The results in Western Maryland are interesting as well. John Delaney lost Garrett and Allegheny counties by wide margins. He held Roscoe Bartlett to a virtual tie in Washington County. He managed to win Frederick; however, the District only contains the solidly Democratic precincts in Frederick City along with some swingier territory bordering Montgomery County. In Montgomery, Delaney won by an unsurprisingly solid margin. All in all, Delaney’s $4 million plus investment of personal funds bought him substantial inroads in Western Maryland even if does not quite match the organic support Kratovil enjoyed on the Shore. Of course, Kratovil was a true product of the Shore, whereas Delaney was a does not live in his district. Culture matters in elections. Lastly, these numbers make me doubt any Republican will be able to win office in Montgomery County within my lifetime. Editor’s Note: John Hayden was the author of the Maryland on my Mind blog from Ocean City. He offered this alternative view to my post on the races for delegate in District 38 on the Lower Eastern Shore. I think your analysis of the District 38 delegate races is appropriate, based on campaign fundraising reports. From a Democratic point of view, I like that your report gives Mary Beth Carozza reason to to feel overconfident. 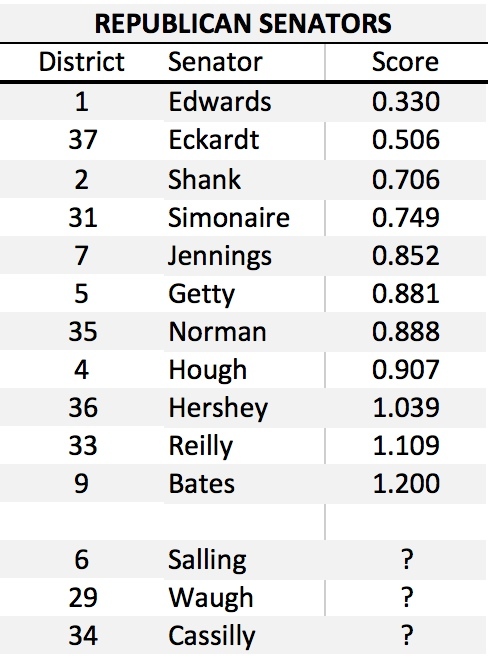 IMO, Norm Conway should be rated as safe, and Judy Davis-Carozza should be rated a toss-up. Norm met his wife when they were both students at Salisbury University (then Salisbury State). They were both career educators in the Wicomico County public schools. Norm and his wife personally know nearly everyone in his Salisbury district. He nearly lost in the sprawling 38B in 2006, but learned his lesson and came back with a strong campaign in 2010 and won easily. His new single-member district is safe for him, IMO. The Judy Davis bio is a mirror image of Carozza’s bio. Judy came to the Eastern Shore to attend Salisbury State, and has lived on the Shore her entire adult life. She married, raised a family, and taught in public schools in Wicomico County and Worcester County. You’re probably aware of the Democratic Emerge program. Judy was handpicked for the first Emerge class in Maryland, which was held last winter. Judy made a lot of contacts through Emerge, and she will have the endorsement of teachers statewide. Those two networks should enable her to raise significant funds after the primary, when Democrats focus on the general election. Also, I’m hopeful that both Mathias and Conway, and Mike Busch, will point Democratic contributors in her direction. District 38C is one of the few places Democrats can hope to pick up a delegate seat, to offset possible losses in other districts. I suspect that key people in the state’s Dem fundraising network will understand the opportunity to pick up a delegate seat, and will support Judy. 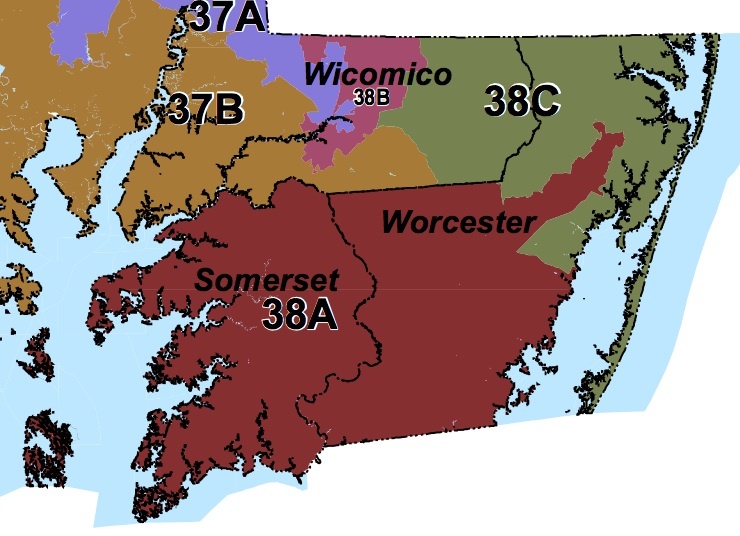 District 38 includes all of Somerset and Worcester Counties as well as much as Wicomico County. It is divided into three subdistricts and features some of the most interesting races in this election cycle. Unlike in much of the State, the general is the real show here on the south Shore. The Senate race is probably the hottest general election contest in the State. Democratic Sen. Jim Mathias faces a tough challenge from Republican Del. Mike McDermott. This is a battle royale between two long successful politicians. Mathias, a former mayor of Ocean City, served one term in the House before winning election to the Senate in 2010. McDermott is a former mayor of Pocomoke City and police chief in Snow Hill who won election to the House in 2010. In January, campaign finance report filings revealed that McDermott had just $20K cash on hand compared to an impressive $208K for Mathias. He will need every bit of it. District 38 is red territory. Though Mathias won in the tough Democratic year in 2010, his margin over his GOP opponent was just 1.4%. Somerset is the most Democratic county in the district–Obama carried it by 1.9% in 2012–but it only cast 16% of the district vote in 2010 and Mathias narrowly lost it. Worcester cast 46% of the vote but is more Republican–Romney won it by 18%. Nevertheless, Mathias who hails from Ocean City won it with 52% in 2010. Portions of Wicomico comprise the remainder of the district. Wicomico is more narrowly Republican, as Romney won by just 5%. But the best Democratic precincts in Salisbury are in the neighboring black-majority District 37A. 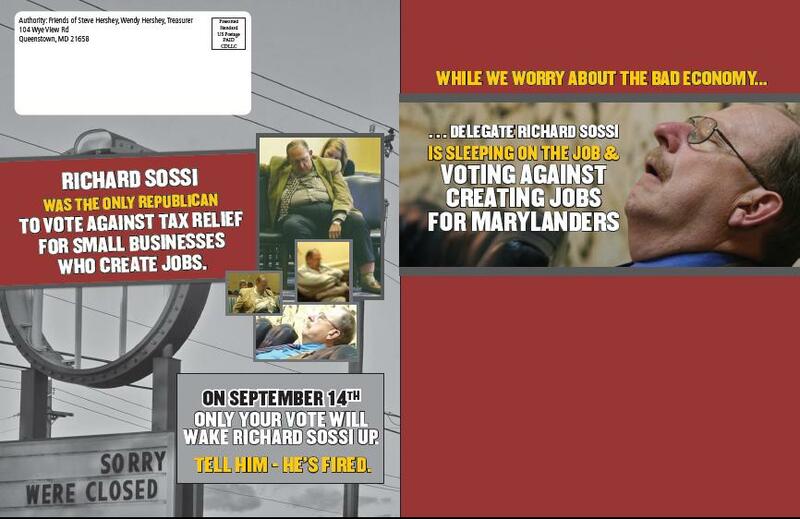 Mathias narrowly lost in Wicomico in 2010. McDermott represents the same people as Mathias so any incumbency advantage is limited. Mathias will need all of his political skill as well as his mighty campaign war chest to beat the Republican lean of the district for a second time. Backed by Rep. Andy Harris, one of my Eastern Shore sources describes McDermott as “to the right of Genghis Khan” on both social and fiscal issues. No one would confuse comparatively moderate Mathias with a Western Shore liberal but the difference between him and McDermott cannot be missed. This race will help shape both Senate caucuses in the future. McDermott’s election will drag the GOP further to the right, bad news for its long-term statewide viability. A loss by Mathias would also weaken the strength of Democratic centrists, pulling the caucus to the left and increasing party polarization. I expect Senate President Miller to go all in to support Mathias in the general election. Can the Republicans do the same for McDermott? And can McDermott raise enough cash once the session ends to run a viable campaign of his own? General Election Rating: Toss Up.